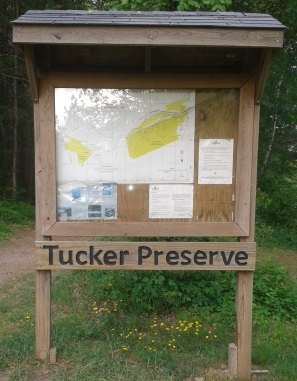 Tucker Preserve and it's hiking trails are one of the many properties of the Wildlands Trust. The property is named after two original owners who donated the property to the Trust. 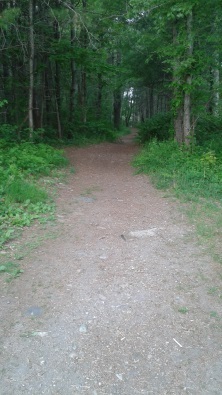 The main hiking trail here helps form a three town, three property loop trail. It is part of an area that is not only rich in history, but rich in recreation as well. 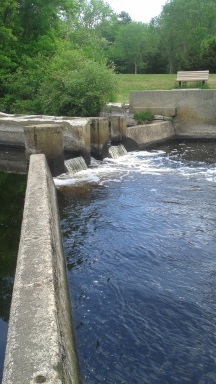 The main entrance to the property is on W. Elm St in Pembroke along the side of the beautiful Indian Head River. 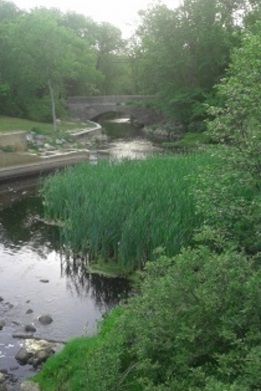 The river forms the natural boundary between Pembroke and Hanover. 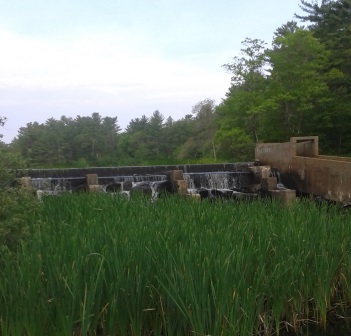 Across the river is the town of Hanover's Luddam's Ford Park, one of the other properties the loop trail connects. 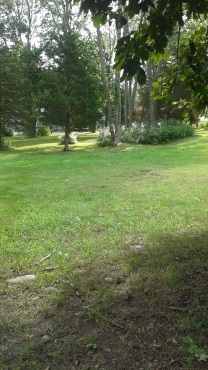 The three property loop trail and an explore of this property begins by first traversing a large grass lawn. At the edge of the forest you will find a kiosk announcing the property with a trail map. The map at the kiosk claims the large lawn is the Pembroke side of Luddams Ford Park. The link to the trail map to the right, helps support this as it shows the preserve in green. What the trail map at the kiosk shows, is the route of the three property trail loop. What I also like to call the "Tour of the Indian Head River". The route of this hiking trail loop will prepare those thinking of canoeing or kayaking this portion of the river with knowledge of problem spots and areas where caution is needed. After the preserve boundary, the trail continues on private property that non motorized traffic is welcome to use. 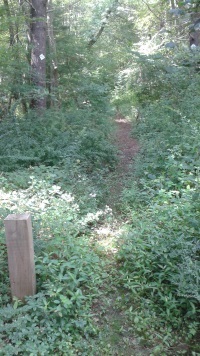 The trail then connects to an area only cited as Hanson Conservation Property. 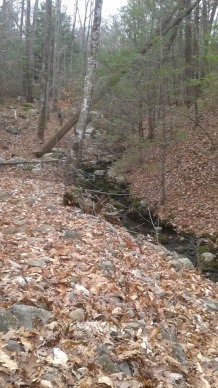 It is the Rocky Run Conservation Area. The loop connector is State St in Hanson which will very shortly bring you to the Indian Head Trail beginning. 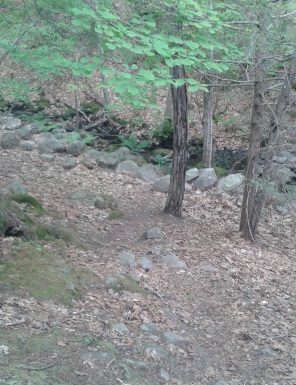 This blends into the Luddam's Ford Trails that ends at the Luddam's Ford Park in Hanover. A path leads out by the bridge over the Indian Head River and over to the Pembroke side again where the loop began. friend or man's best friend! seems to be a favorite fishing spot! Then there is the forest! hiking trails into the forest. view the Indian Head River. Well placed benches for resting with a view! get a bit more rustic and interesting! One warning, hiking through the preserve, there are other trails that connect and lead out of this preserve. 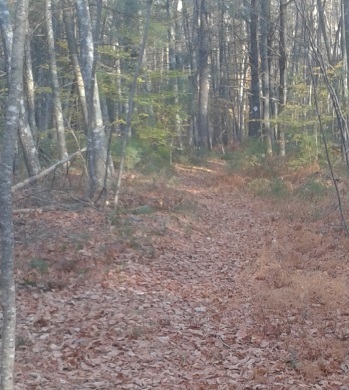 Many lead to private land and are on trails that no doubt have existed for many, many years. Some of these are not on the map. 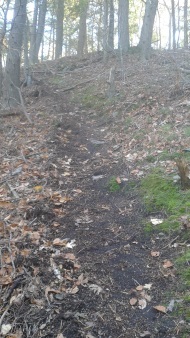 One way of knowing that you have left the preserve on these trails is that they will not be as well maintained. You will also not find the Wildland trust logo blazes pictured above. 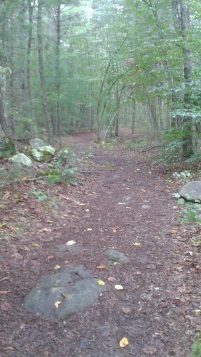 The high ground trails seem to blend into the inner private trails that lead to Rocky Run in Hanson. 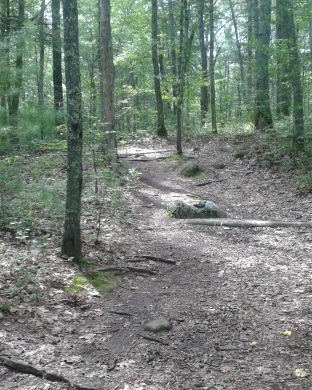 There are some trails in the Preserve that use less logos and some blue circle blazes. Some of these are not on the map as well. Hike across the grass lawn and enter the preserve at the kiosk. 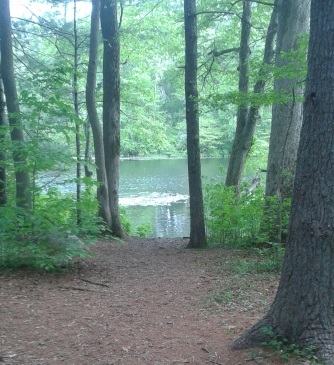 Continue along the hiking trail past the campfire ring. 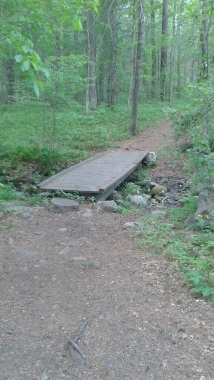 Shortly after will be a small bridge crossing a stream that is dry in the summer months. 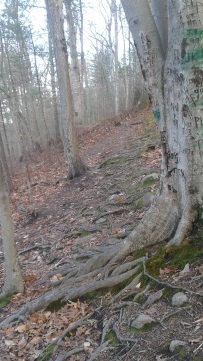 The hiking trail will pass through a utility line, climb slightly and pass by a bench traveling over many tree roots. At 1/3 mile you will arrive at the first intersection. Take a left here and the trail will climb moderately. Shortly, but after a good test of your fitness level, the trail levels again, passing through a rock wall and at .55 you will arrive at a second intersection. The way of the inner loop trail goes right here. If you go left, it will bring you to the other entrance on Old West Elm St. and to the outer loop trail as well as other trails not marked as well or that lead out of the preserve. Some of these are described below. Going to the right at this intersection, the trail will become just slightly more narrow but still cart path sized and head slightly downhill. It will pass through another couple of the many stone walls in the area and a narrow path to the right will lead away. The trails found on the right along this upper portion of the inner loop connect to the lower portion of the loop. 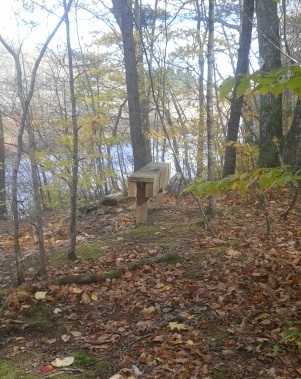 This portion of the loop trail is on high ground above the Indian Head River. Taking any of these short cuts will lead you on a steep descent downhill. Soon the trail curves to the left and heads away from the river. 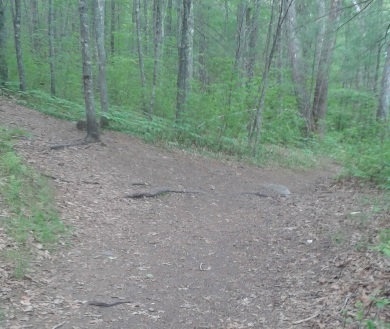 The trail curves to the right and if you look carefully you will find a narrow trail blending in from the left. This trail on the left is the outer loop trail intersecting with this inner loop portion. The cart path trail we are traveling on will become a bit rocky and take a gradual downhill descent. Soon at .73 miles, there will be a more narrow trail leading to the right. 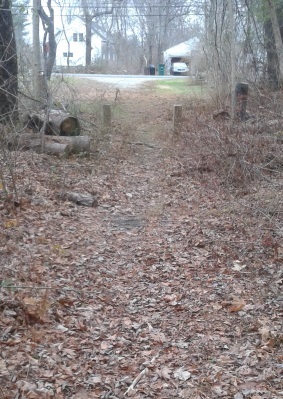 It soon becomes apparent that this cart path trail blended with one of the older established trails through the area. On the narrow trail to the right, Wildlands Trust Logos appear inside the trail and show the inner loop trail now turns on this right. The cart path trail, continuing straight toward private trails, will become much less maintained looking. Soon, you may hear the sound of water and after there will be yet another intersection. The Wildlands Trust logo sits in the middle with arrows pointing both ways. Our journey will lead to the right here. Going left at this intersection, there will be a stream with stone steps to cross. This is the way of the upper trail portion of the Three Town Loop. 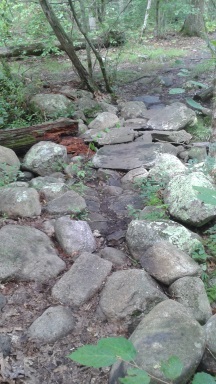 The trail now leads moderately downhill over a rocky route. The trail runs along the stream giving way to some very scenic views. Some faint trails lead left over to the stream. At the bottom of the hill, at .87 miles, the trail intersects the lower trail that leads along the river. Here the inner loop trail goes right, while the lower trail and the way of the three town loop goes left crossing the stream on another stone step way across. If this is your first visit to the preserve, going left you will soon visit the area across the river from the tack factory that once existed here. 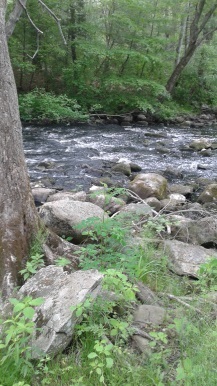 There are some rapids through this small gorge area that was once dammed, but failed during a hurricane. 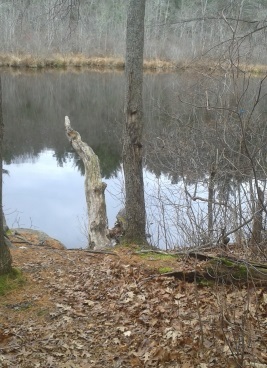 The property line of Tucker Preserve ends in this area, but only on the higher ground trails is there evidence of this. going right at the intersection the trail slightly climbs again up to a viewing area with a bench. Continuing on along this trail, the way is narrow and a bit rugged. It descends after the bench and climbs immediately after. For a time it runs along the side of a hill above the river and then at 1.12 it climbs again to an area with a large boulder. There is a rather steep path down to the water at this area. It continues a bit rugged. to the upper ground trails can be noted. It will once again pass through lower portions of the same stone walls it passed through on the higher ground trail. Soon it will pull away from the river a bit and you will find yourself at the original first intersection. From here, if you have the time and energy, an explore of the outer loop and other entrance can be done. Use this same route up hill to the next intersection, this time going left if you have already traveled the inner loop route. If not, follow the inner loop instructions to the second intersection, going left. After this second intersection you will pass through a stone wall and shortly thereafter a narrow hiking trail will lead to the left at .62 miles. This narrow trail, only .18 in length, will form a loop and intersect this trail again on the way heading out to the entrance on Old West Elm St. Continuing on the main trail, just before the next pass through another rock wall, the way of the outer loop leaves to the right at .68 miles. are both only marked in blue dots. the intersection with the small loop trail is at .77 miles. 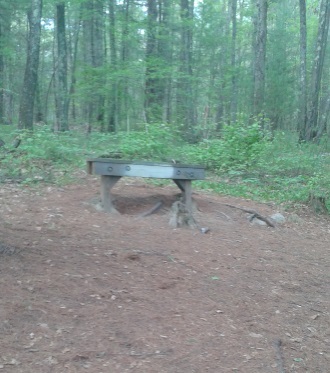 This is the only place where a preserve logo will be found on the small loop trail. The hiking trail heading out to the opposite entrance will turn right here and wind again to the left through a more narrow trail. Looking carefully to the right just before a cut fallen tree, another faint trail leads to the right. 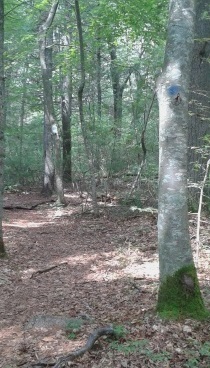 This hiking trail heads out on the private land trails, here you will find many intersections. In the fall, only head out on these if you have blaze orange apparel on! Continuing on the trail to the opposite entrance, at .92 there will be a small stream crossing over a culvert. Shortly after at one mile, the entrance on Old West Elm. This is on an access way between two houses. One to the right is number 18. This is most likely just a neighborhood entrance way. 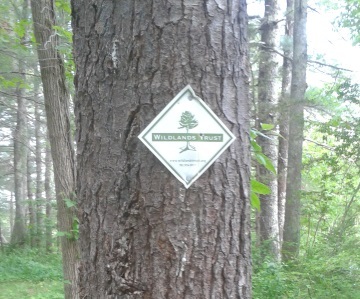 a suggestion would be to follow back to the intersection with the small loop trail end where the one Wildlands Trust logo appears, follow that to it's beginning. Along the way you you will find many blue dots along a narrow passage through a stand of baby pine trees. Soon you will return to the main trail, turn left here and head back up the original route taken to the Outer Loop Trail. At the entrance to this trail you will be at 1.48 miles. The blue dots continue making me believe that previously the loop trail and the outer loop trail were one before the preserve trails linked to them. There is a double blue marking to signify a turn. They are placed side by side. Usually the second one is placed slightly above and either to the right or left of the lower marking to show the direction of the turn. ? At another .18 there is another double dot but this time with an arrow pointing to the right. This marking is closer to how they should be displayed, but the top dot should sit slightly to the right to signify a right turn. The way continues on a much more narrow hiking trail here. 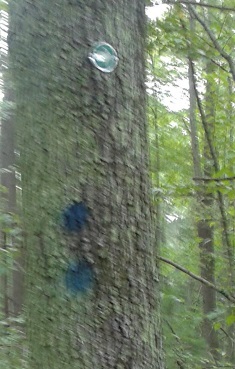 The blue dots continue til at .26 or 1.74 total miles, it blends into and with the inner loop trail. 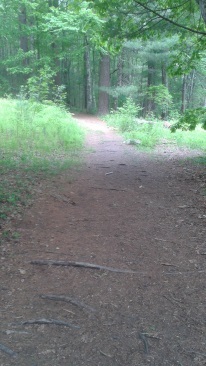 There is approximately another 3/4 miles of trail back to the parking lot bringing that total route to 2 1/2 miles. In early December, hiking trails are not as pretty, but interesting, as more of the forest landscape can be seen. at other times of the year! This entrance looks much different in late fall! From exit 13 on route 3 in Hanover follow route 53 South. Continue through several lighted intersections til the intersection with route 139. Continue to the next intersection at Broadway St.Take a right at this intersection and then shortly down the street a left on Elm St. Follow this about 1/2 mile. Luddams Ford Park will be on the right, then you will pass over the bridge over the Indian Head River. The next left will be the parking lot for the Pembroke side of Luddams Ford Park with Tucker Preserve across it's lawn. This map was a bit confusing to me. Most likely due to other trails that intersect that are not labeled here. Hopefully my guide will help ease the confusion.